Don’t know about where you live — but here in Ann Arbor Michigan it is cold! But Janet and I don’t mind and we’ve been walking to keep in shape and enjoy the outdoors. It snowed last night so it was fun looking at all the track little creatures left in the fresh powdery snow, some as big as deer. The tracks to the right intrigued us since they started from nowhere and had a fan pattern to the left. We immediately thought of angel patterns our grandkids make in the snow by laying on their backs in the snow and waving their arms and legs back and forth. 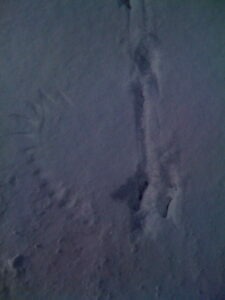 We finally figured out what made these tracks. UPDATE: I am now a bit confused myself now. At the time I thought the tracks were left by a crow since the size somewhat fit and there were lots of crows in the trees nearby. However, the next day we were walking through the same area and saw a flock of 24 wild turkeys in the field. They had walked all the way across the road at the same place the tracks were seen the day before and when they saw us they all took to the air. So, what I thought was a crow, might now have been a turkey. Mystery continues. By the way, the word snow, or variations such as snowy, are used 27 times in the Catholic NAB translation of the Bible. 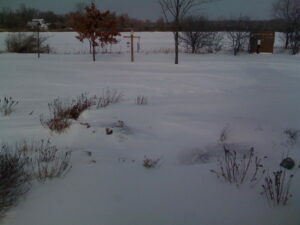 Usually snow is used to exemplify something very clean and pure.